Talking with manufacturers, designers and reps at the High Point Market, one thing was clear: sellers have become much more sophisticated in protecting their intellectual property; on the buyer side, unfortunately, designers/decorators are still playing catch-up on how to protect their brand and work product. As a lawyer specializing in IP protection and enforcement and as an owner of retail and design businesses, I was also struck by how manufacturers of case goods, upholstery and décor items are increasingly using IP not only to protect their valuable work product but also to use that protection as part of their sales efforts. 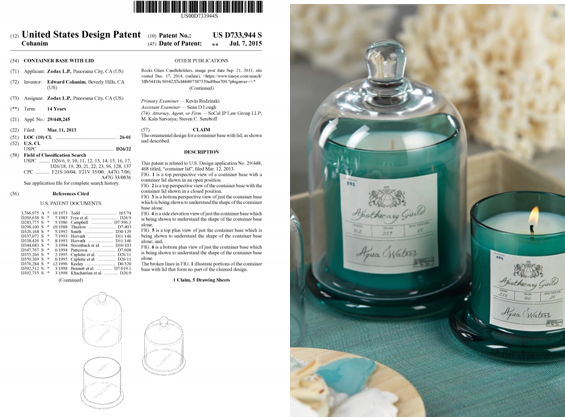 California-based Zodax obtained a patent for its distinctive dome-based candle in 2015, which it was selling @highpointmarket as part of its distinctive Apothecary Guild® collection at High Point. A particular selling point made to us repeatedly by Zodax’s rep was that because of the patent, we would be assured that the product would not be ripped off by cheap imitations. Trade dress, trademark, copyright and design patent protection, along with advanced planning before a product enters the market, are essential in designing an overall protection strategy. Because of the recent decision of the Supreme Court in Fourth Estate Public Benefit Corp. v. Wall-Street.com, LLC, advanced planning for copyright protection is particularly critical. Ideally, this strategy should be put in place when the product – case good, upholstery, accessory – is initially designed. Each of these decisions affects the protection and enforcement of rights in design. Registration in the Patent and Trademark Office (USPTO) carries with it a presumption of validity and a prima facie showing that the registered design is entitled to protection. But design protection at the USPTO is not easily obtained before there have been sales and promotion of the product. In order to increase the chances that a design will achieve protection afforded other trademarks, manufacturers and designers working with counsel must critically evaluate how sales and advertising will be made. If a design configuration is nonfunctional and associated in the minds of consumers with a single source, it can be protected as trade dress. In the past, it was difficult to establish that any particular design was protectable trade dress. However, since the Supreme Court decision in Star Athletica, LLC v. Varsity Brands, Inc. copyright protection for the aesthetic elements of useful articles, including case goods and furniture, has expanded. A copyright application can be filed at the time a design is created or when it is published. So too, while functional aspects are not eligible for copyright protection, the decorative elements may be. Given the relatively low cost of applying for a copyright registration, companies can benefit from having a system in place whereby every design created is the subject of a copyright application, or at least those designs that are likely to be registered. Where designers or others who are not full-time employees are engaged to create designs, there should be written agreements in place acknowledging that the works are works for hire and, where possible, also assigning all rights in the design to the entity commissioning the works. Registration of photographs of case goods, upholstery and décor items and/or catalogs containing them should be made, particularly when unauthorized resellers or counterfeiters are selling on Amazon, Etsy and eBay, to name a few. Often, these resellers and counterfeiters will also use a trademark, if there is one, along with representations to unsuspecting customers that the copies are actually authentic. Thus, adopting and registering a trademark along with the development of a design is recommended. A well-thought-out strategy for protection of designs which involves consideration of trade dress, copyright, design patent and brand protection, as well as purposeful advertising and selling strategies, can increase the protection and enforcement of designs. For more information, contact David Posteraro at drp@kjk.com or 216.736.7218, or reach out to any of our Intellectual Property or Brand Enforcement professionals.